I’m just messing around this morning in the kitchen as the sun comes shining in. Lovely morning for a biscuit, but with something more! Preheat oven to 425°. Stir together flour, baking powder, sugar, and salt. Cut shortening and butter into flour mixture with pastry cutter or two knives until crumbly. Add buttermilk and stir until just barely combined. 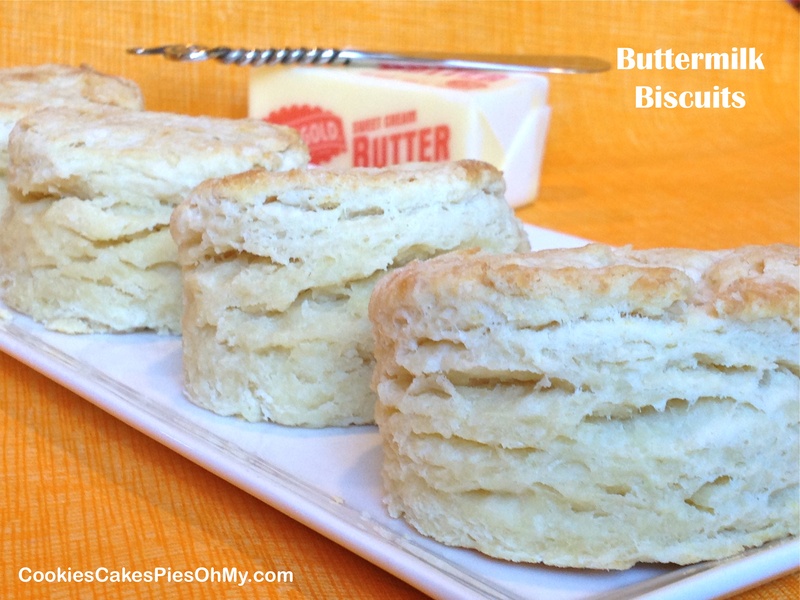 The less biscuit batter is touched the better. Let dough sit while mixing together filling, stir together sugar, brown sugar, cinnamon and nutmeg. Turn dough out onto well floured surface. Remember, the less handleing the better. Gently roll out to a 9″x12″ rectangle. Sprinkle all the filling evenly on one half, 9’x6″. Fold in half to make a 9″x6″ rectangle. Cut into six 3″x3″ pieces. Transfer with floured spatula to silpat lined baking tray, about 1/2″ apart. Bake 12-14 minutes, until golden brown. 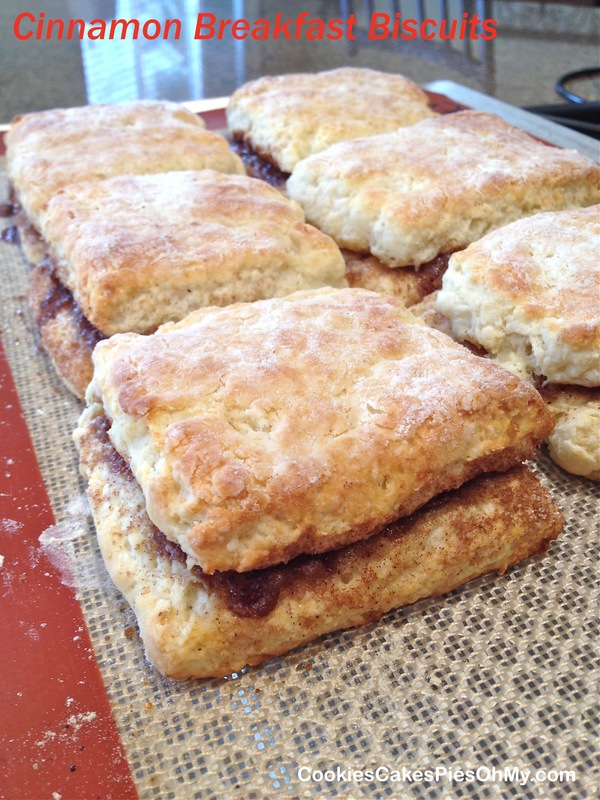 Making really good biscuits can be a challenge (at least for me) because the trick is not handling the dough too much. You basically need to leave the dough sitting there with lots of flour and crumblies all around and everything not totally incorporated into a nice neat ball. How do you do that? It looks so MESSY! If you can do it and tolerate the mess, you will get a tall, flaky biscuit that your perfectionist, nit-picker, stickler, fussbudget self will love! Preheat oven to 425°. In large bowl, stir together flour, salt, sugar, and baking powder. Cut cold butter unto dry ingredients. Whisk together buttermilk and egg and pour into flour mixture. Hand mix, before it all comes together, turn out onto floured surface. The less you touch it and work with it the better, just like pie pastry. Gently bring dough together and roll out to 1″ to 1½”. Cut out in rounds about 2″-2½” in diameter. Place on silpat lined or sprayed baking sheet right next to each other, barely toughing. Bake 12-15 minutes depending on how big you cut them. Original recipe – Ruth’s Diner Salt Lake City, UT. 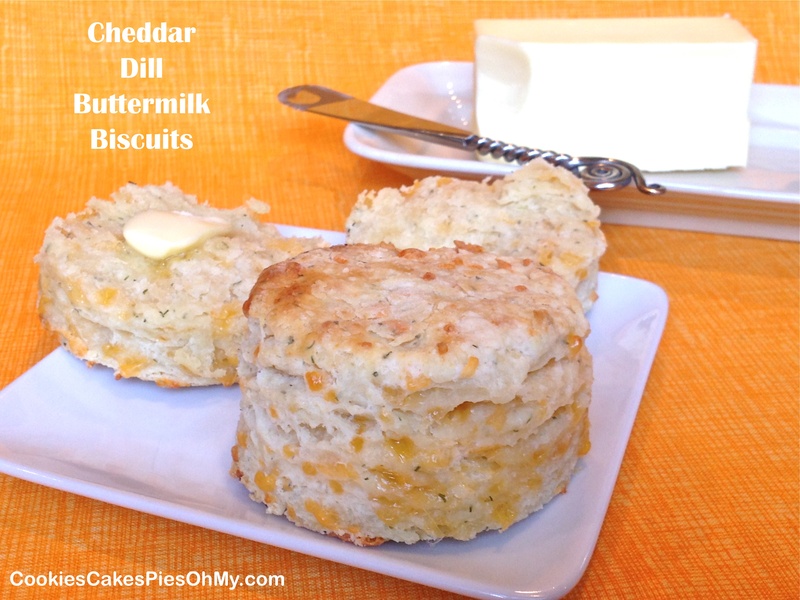 To flour mixture add 1 cup cold shredded sharp cheddar cheese and 1 tsp dry dill weed (or fresh dill). Try other combinations of herbs and cheese. One of my very favorite desserts is Chocolate Sheet Cake. Now, after making this cake, I believe it’s a toss up! Both excellent. 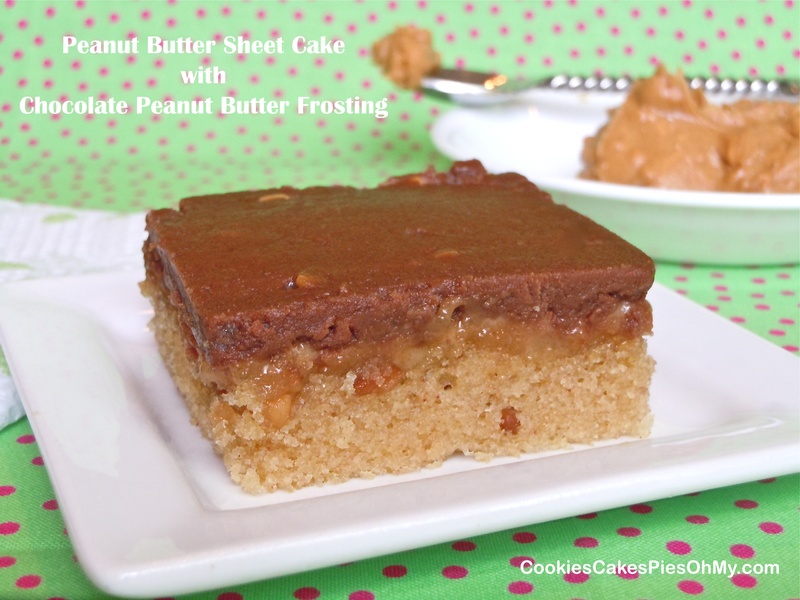 In the future when I make sheet cake I will just have to make two, one of each! Preheat oven to 350°. Spray a 15″x10″ sheet pan with non-stick spray. In large bowl, stir together flour, sugar, baking soda, and salt, set aside. Combine butter and water in saucepan, bring to boil. Remove from heat and stir in peanut butter and oil. Stir mixture into dry ingredients. Stir together eggs, buttermilk, and vanilla, stir into peanut butter mixture until well blended. Spread batter in prepared pan. Bake 18 to 22 minutes or until toothpick inserted in center comes out clean. While cake bakes, make frosting to pour on as cake comes from oven. In saucepan, stir together butter, peanut butter, milk, and cocoa over medium heat just until starts to boil. Remove from heat, stir in powdered sugar, and vanilla until smooth. Pour over warm cake. My sister in law and I were talking about red velvet cake, we agreed that we didn’t think it has enough flavor. I told her when I make red velvet cake I add a lot of cocoa, afterall, I am a self confessed chocoholic. 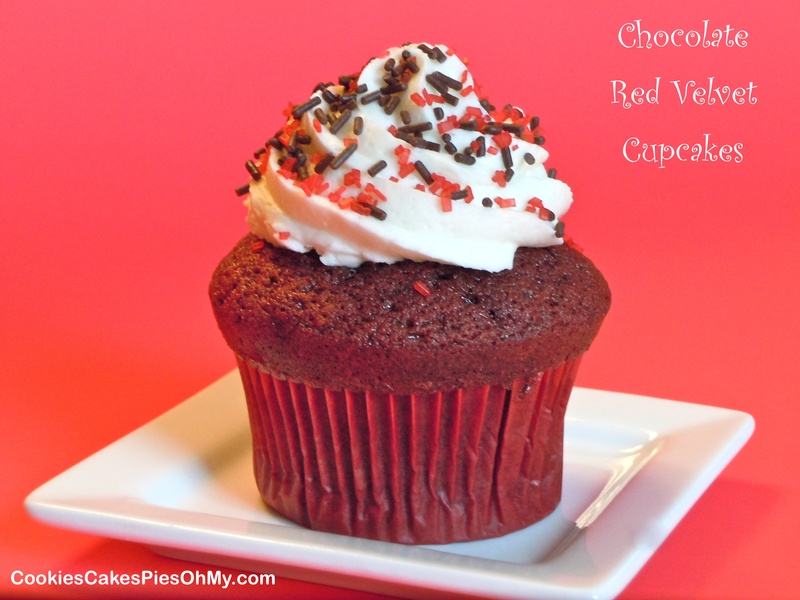 I thought I would share my version for Chocolate Red Velvet Cupcakes. Preheat oven to 350°. Prepare cupcake pan with cupcake papers. In medium bowl, whisk together flour, cocoa, baking soda, and salt. In large bowl with electric mixer, cream butter and sugar. Add eggs and mix well. Mix in sour cream, buttermilk, and vanilla. Gradually mix in flour mixture until well incorporated. Scoop batter into prepared cupcake pan, filling each cup about 2/3 full. Bake 20-22 minutes. Cool in pan about 5 minutes, remove and cool completely before frosting. Whip butter with electric mixer for about 5 minutes until light in color. Add powdered sugar, vanilla, and milk until perfect piping consistency. Pipe onto completely cooled cupcakes, add sprinkles. I usually make muffins with the motto “Go big or go home”. I made six very large muffins, but make twelve smaller ones if you want. 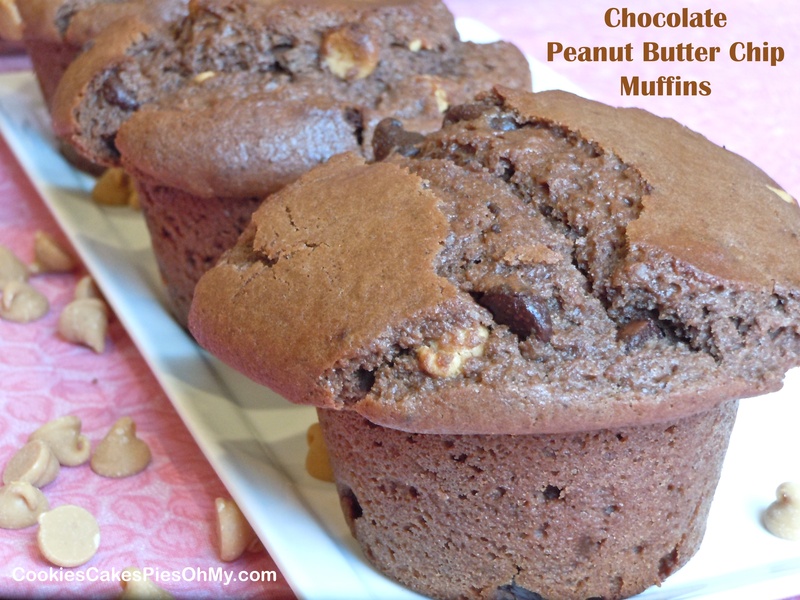 It’s a muffin, not cake, go ahead and eat the whole thing, yum! Preheat oven to 400°. Whisk together flour, baking powder, salt, and cocoa in large bowl. In another bowl, whisk together buttermilk, oil, egg, and sugar, add to flour mixture. Stir just until combined. 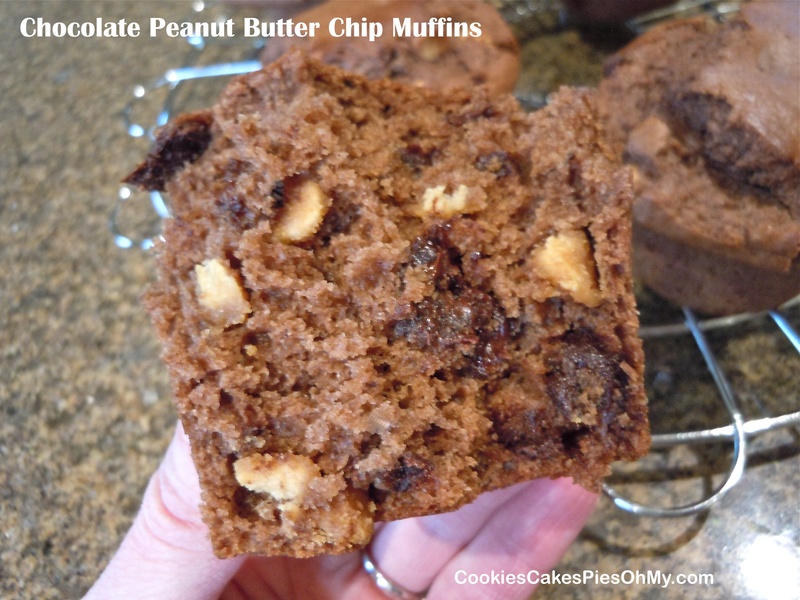 Fold in peanut butter chips and chocolate chips. Scoop into 6-12 sprayed or paper lined muffin cups (I use Demarle muffin tray, no prep necessary), you decide how big you would like them. Bake for 24-26 minutes (this was the time for my giant muffins, small bake 18-20) or until center is set and pick in center comes out clean. Cool in pan 5-10 minutes, remove to wire rack. 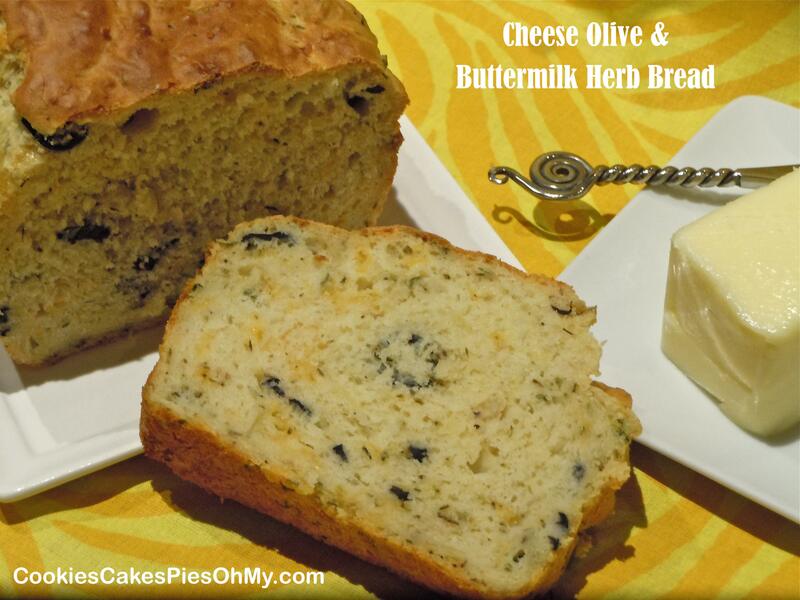 This is a delicious quick bread with herbs, cheeses, and olives, a recipe on sugareverythingnice.blogspot.com. Great with soup, green salad, or make a grilled cheese sandwich. If you are like me, you will be too impatient and just eat a big fat slice warm right out of the oven with a little butter! Perfect. Preheat oven to 350°. 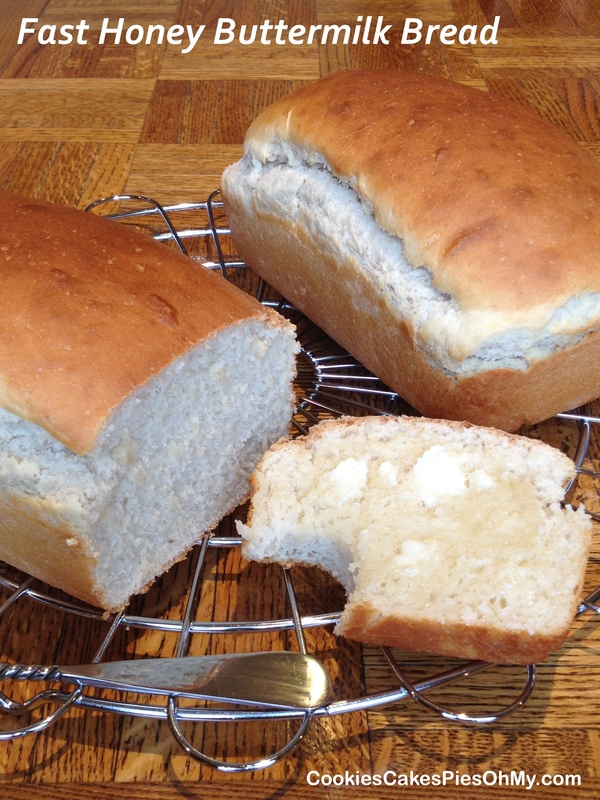 Generously butter large loaf pan and dust with flour. In large bowl, mix flour, baking powder, baking soda, salt, pepper and mustard. Add Parmesan and cheddar cheeses, olives, sundried tomatoes, spring onion, parsley and thyme and stir together. In separate bowl, whisk eggs, olive oil, and buttermilk. Add to dry ingredients and stir until just combined. Pour batter into prepared pan. Bake 40-45 minutes or until fine skewer inserted in the middle of the loaf comes out clean. Leave in pan for 5 minutes before turning out onto wire rack. 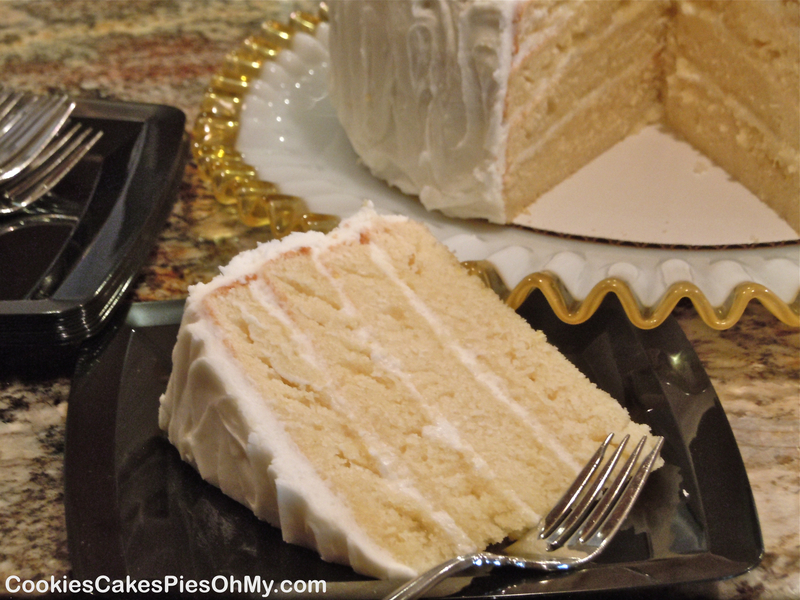 When I make a layer cake, I want a tall cake. It is a little harder to achieve with 9 inch cake pans, I need to invest in 8 inch pans. So, I made this cake doubling the ingredients and making four layers to get the height. Maybe it’s the more equal distribution of cake and frosting with the four layers that I like…anyway, it’s tall and yummy. Preheat oven to 350°. For cake, with electric mixer cream butter and sugar. Mix in lemon zest, lemonade concentrate, and vanilla. Add eggs, one at a time, beating well after each addition. Whisk together flour, baking powder, baking soda, and salt. Add flour mixture and buttermilk alternately to sugar mixture, beat well after each addition. Here is where I do something a little different. I bake half the batter at a time, pour 1/4 of the batter into each of my two 9″ round cake pans coated with cooking spray. Bake for 20 minutes, cool in pans 10 minutes, then remove from pans to wire racks. Wipe out pans, spray pans again, pour remaining batter evenly between the 2 pans. Bake and cool just as the first two layers. You may want to bake all at once to make two tall layers, keep that way or slice in half to make four, I am not sure of the cooking time because I didn’t do it that way. Make sure all layers are completely cool before frosting. With electric mixer, whip butter and cream cheese together. Add lemon zest and lemonade concentrate. Slowly mix in powdered sugar. Assemble cake, store cake loosely covered in the refrigerator. Sweet juicy peaches! 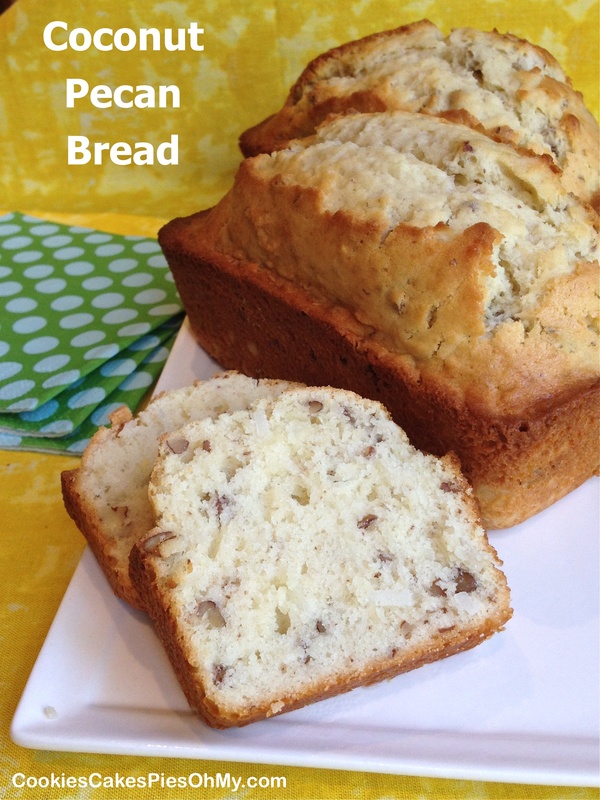 We are enjoying them while they are in season, a sweet surprise in this delicious breakfast cake. Preheat oven to 350°. Spray and flour a 9″ round springform pan. 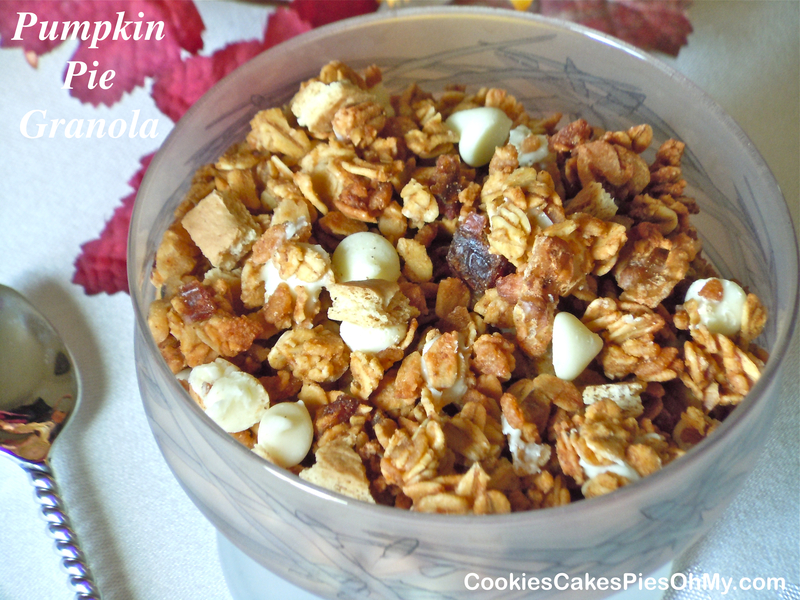 In medium bowl, stir together flour, sugar, brown sugar, cinnamon, and nutmeg. Cut in butter with pastry blender until coarse crumbs form. Stir in chopped pecans, set aside. In large bowl, stir together flour, sugar, baking powder, baking soda, and salt. In medium bowl, beat eggs, soft butter, buttermilk, and vanilla until creamy. Stir into flour mixture and mix just until evenly mixed. Do not overmix. Spoon batter into prepared pan and spread evenly. Arrange peach slices on top of batter. 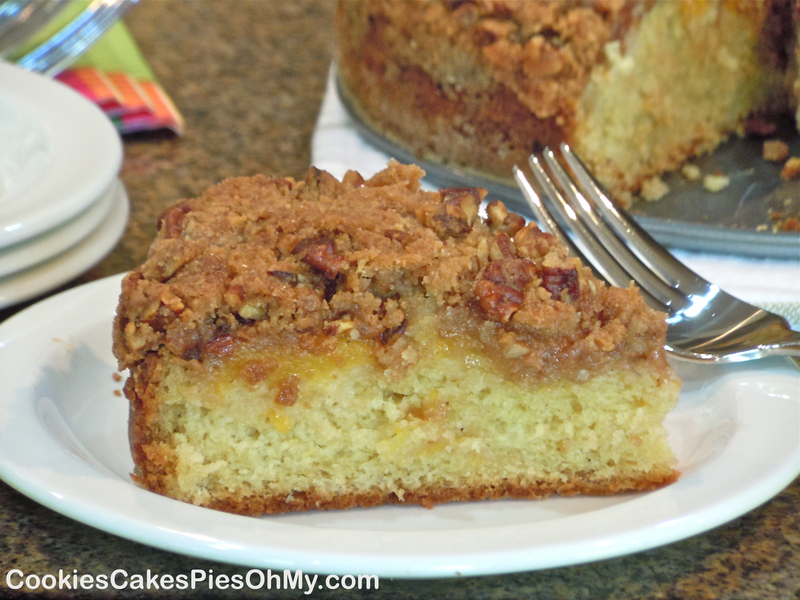 Gently press slices into batter, and sprinkle streusel topping evenly over top of peaches. Bake 40 to 45 minutes, until topping is golden brown and toothpick inserted in center comes out clean. Cool on wire rack for about 20 minutes. Serve cake warm or room temperature.